Well, that was quicker than expected. While the Galaxy S II is still being launched in some markets (e.g. 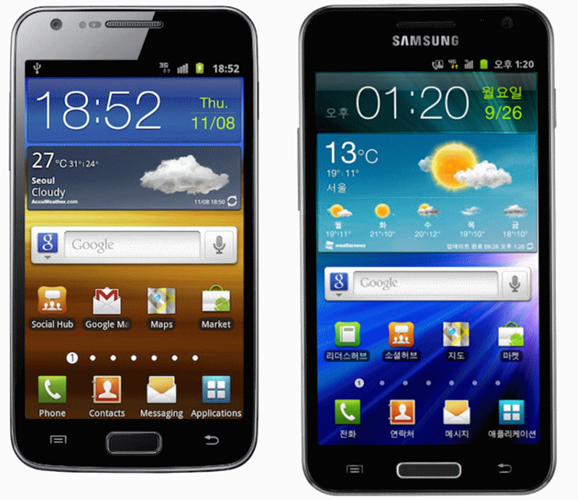 the United States), Samsung has already announced the Galaxy S II HD which comes with a massive 4.65” display having 720p resolution and a technically faster 1.5GHz dual-core chip. The news comes straight from Samsung. There were two new Samsung phones announced today: the Galaxy S II LTE and the Galaxy S II HD LTE. The names pretty much describe everything you need to know about the phones but we’ll talk about them anyway since this is just so very exciting! Before you head down, do keep in mind that both phones share the following features with the original Galaxy S II which was announced back in February: Android 2.3 Gingerbread, a powerful 8 megapixel camera that does 1080p video recording, 16GB internal storage along with Wi-Fi, GPS and Bluetooth. That is where the similarities end: The Galaxy S II LTE, as the name implies, comes with support for 4G-LTE networks for hyper-fast downloads and on-the-go HD video streaming. It has a 4.5” 800×480 display and is powered by a dual-core 1.5GHz processor. Now, we move on to the most exciting part of today’s announcement: the Samsung Galaxy S II HD LTE. The first and most important thing you’ll notice is the use of HD in the phone’s name; yes, this is the second Galaxy smartphone (other than the Galaxy Note) to get a 720p )(1280×720) resolution display. Sized at a massive 4.65", the Super AMOLED HD Plus display on the GS II HD LTE has a rather high pixel density of 316 pixels per inch. It also comes with a dual-core processor clocked at 1.5GHz and, as you can tell from its name, 4G-LTE connectivity. Both the Galaxy S II LTE and Galaxy S II HD are powered by a 1.5GHz dual-core processor (which is technically faster than the 1.2GHz dual-core chip on the original GSII) and come with 1GB of RAM as well as 4G-LTE connectivity for supported networks. They also look a bit different because of the larger screen size and rounded-edges. As a proud owner of the Galaxy S II, I do feel a little, well, cheated. I’m sure folks who have already bought the Epic 4G Touch for Sprint also feel the same way, but we must all understand that this is how technology evolves and we have to live with it. No official word on the pricing and release date has been given, but we do have information that the GS II LTE will be exclusive to Sunkyoung (SK) Telecom while the GS II LTE HD will be available not only on SK Telecom, but also on LG U+ and KT in Korea.